The symbol of peace, well recognized around the world, has become a fashion statement and when it is seen, we tend to associate it to a specific vein of society who think an irregular and unrealistic way. It has become such a stylized symbol that we forget what the entire purpose and meaning behind such icons is. The Banner of Peace symbol, or 'Pax Cultura' or even 'Roerich�s Pact', is an assortment of circles that has been found drawn on old relics of ancient cultures spanning the globe. The meaning behind the three circles varies across cultures, but like the Yin Yang carries with it the idea of total harmony. Variations include the 'body, spirit and mind' and 'art, science and religion' amongst others. The trinity of circles closely resembles ideas found in almost every world religion. 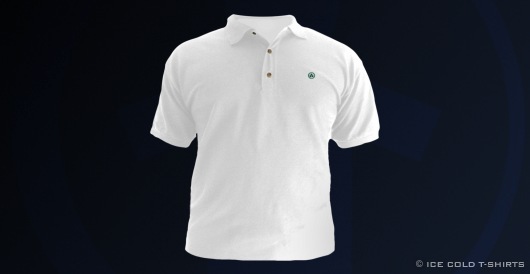 The logo is embroidered unto the left chest of a very durable white Polo Golf Sport shirt using emerald colored Rayon threads. Buy and wear it for the purpose, not the symbol.